Robert Henry "Bob" Bescher (February 25, 1884 – November 29, 1942) was a baseball outfielder who played 11 seasons in the major leagues. Born in London, Ohio, he played his best seasons with the Cincinnati Reds, and was one of the National League's best base stealers during his time. Bescher originally attended the University of Notre Dame, but did not play college baseball there. He played college football at Wittenberg University before signing his first minor league contract in 1906. In September 1908, he joined the Reds for the first time and became the team's regular left fielder in 1909. The switch-hitting Bescher played 5 seasons with Cincy, and established himself as a dangerous player on the basepaths with the Reds. 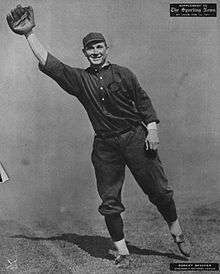 He led the NL in stolen bases for four consecutive years from 1909 to 1912, and his 81 stolen bases in 1911 set a league record which was not broken for over 50 years. Outside of stolen bases, he was the NL leader in runs in 1912, and was the NL leader in walks in 1913. Also in 1912, he hit a career-best .282 and finished 5th in voting for the Chalmers Award, a forerunner to the modern MVP award. He played for the New York Giants in 1914, after being traded there in exchange for Buck Herzog, and hit .270 in his lone year in the Big Apple. Three seasons with the St. Louis Cardinals followed, which ended after he was traded to the minor league Milwaukee Brewers, the trade coming at a time before minor league teams were affiliated with Major League clubs. Bescher eventually returned to the majors in 1918 to play 25 games for the Cleveland Indians to end his big league career, although he continued to play in the minor leagues into his 40s. He settled back down in London after his Major League career to run a local lodge. He later died at the age of 58 in a car accident after being hit by an oncoming train.